Plans are complete for the 5th annual series with IBMA Entertainer of the Year and guests at historic Colonial Theatre. “Our winter concert series is a kind of gift to our community. It’s an opportunity to share the talents of some really amazing artists that we admire and don’t usually get to perform with,” says Balsam Range’s Tim Surrett. Guests for each of the five concerts include fan favorites and award winners. The 2014-15 series will include The Jeff Little Trio with Steve Lewis and Josh Scott; The Molly Tuttle Trio; North Carolina’s own, The Harris Brothers; The Snyder Family Band; and The Studio Dream Team of musicians Jeff Collins, David Johnson and Tony Creasman. Concerts are held at the Colonial Theater in Canton on the first Saturday of each month, December 2014 through April 2015. 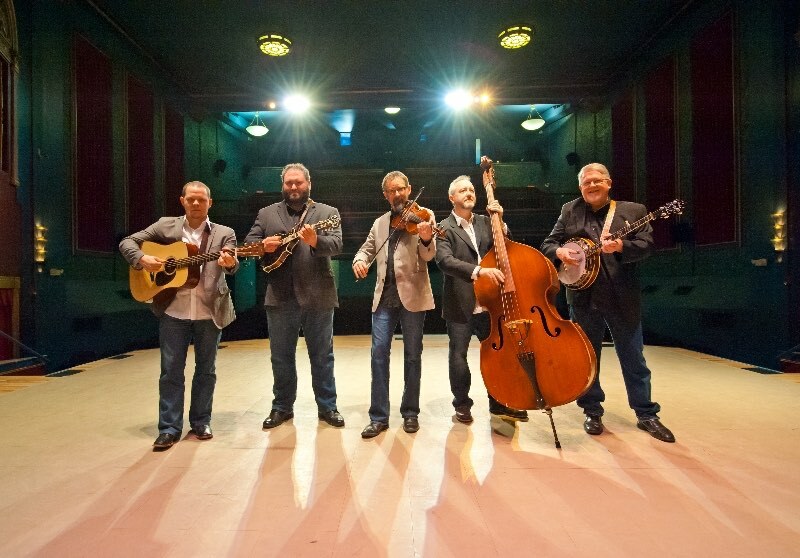 Balsam Range, winner of the 2014 IBMA Entertainer of the Year, also performs at each show. Special guest artists are selected by the members of Balsam Range. Tim Surrett, Buddy Melton, Caleb Smith, Darren Nicholson and Marc Pruett often use their many hours on the road to talk about and share with each other the music of artists they admire. Balsam Range tries also to bring artists to the series who don’t regularly play in the area. Past concerts, which have all been sell-outs, have boasted guests from among the top names in the business as well as fast-rising stars of acoustic music. Guests have included Tony Rice, Bobby Hicks, John Wiggins, Carl Jackson, Jerry Salley, Larry Cordle, Jim Hurst, Shawn Camp, The Sweet Lowdown, John Driskell Hopkins of the Zac Brown Band and more. Each of the five concerts will support a different area charitable organization, as chosen by the members of the band. Tickets are available for $22 at The Colonial Theatre box office (53 Park St. Canton, North Carolina 28716) or by calling 828-235-2760. All shows begin at 7:30 PM Saturdays, with doors opening at 6:30 PM. Tickets are nonrefundable and date specific. The band gratefully acknowledges its sponsors for the 2014-15 series: Amy Spivey of ERA Sunburst Realty, The Waynesville Inn Golf Resort and Spa, and Smoky Mountain Roasters Coffee Shop. In addition to IBMA Entertainer of the Year, Balsam Range was also honoured with Vocal Group of the Year, and single awards were given to Buddy Melton (Male Vocalist of the Year) and Tim Surrett (Mentor Award – one of a series of special honours called Momentum Awards – for his inspired work with young and developing artists).